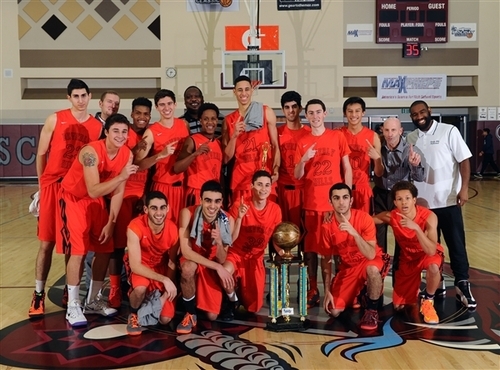 The boys’ varsity basketball team was crowned champions of the Gear To The Max division at the 2014 MaxPreps Holiday Classic in Palm Springs. The Normans surpassed Urspring, a German club, in the championship game on Dec. 30, 49-38. In the tournament, Beverly defeated Redmond, JSerra Catholic, Cathedral Catholic and Urspring. As well as the championship, Norman center Chance Comanche was awarded Most Valuable Player of the tournament. Regardless of Comanche’s valuable play, Coach Jarvis Turner emphasizes the fact that the win was a team effort. “You know Chance got the MVP of the tournament, but it was pretty much a great team effort. Eman and Navid played well. Jalen, Max and Trevor, they all played well. It was a collective effort by everybody, and they just played well as a team. Nobody was really outstanding or played great but everybody was solid and just playing the game the right way,” Turner said. Point guard Eric Ross recounts the championship victory, and realizes the implications of the game on the rest of the season. “It was really exciting. It felt good and brought us together as a team. I hope we can use this as momentum for the rest of our season,” Ross said. While Turner recognizes the strong competition in Ocean League, he remains confident in his team’s ability to win the league. The Normans followed up their championship run with a 59-44 home victory against Milken on Jan. 8.